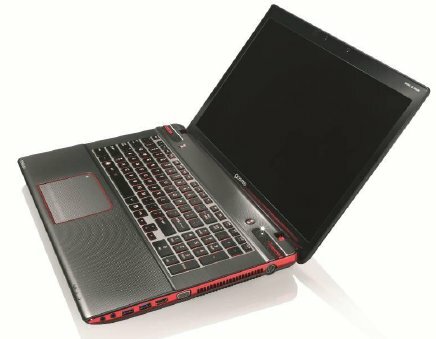 Toshiba offers a preview of the Qosmio X870, a new 17.3" gaming laptop that will be available in Q2 2012. It promises the latest Intel processors and next-gen NVIDIA GPUs. Toshiba UK today unveils its most advanced gaming laptop to date – the new Qosmio X870. Designed for gaming and multimedia enthusiasts, the X870 offers a first-class specification, with advanced graphics performance, incredible imaging technologies and a striking design creating an impressive and powerful package to satisfy even the most demanding user. The Qosmio X870 is powered by the latest Intel® processors, ensuring fast loading times and solid performance from a range of demanding applications. Generous RAM capacity guarantees that the most power-hungry games run smoothly, and also enables multiple task-intensive programs to run smoothly without a dip in performance. The inclusion of next-generation NVIDIA® graphic processors also contributes to incredible hi-resolution images and stunning 3D renders in both gaming and movie playback. A stunning 43.9cm (17.3”) TruBrite® 3D screen displays games and movies in glorious Full HD quality (1920x1080p), providing incredible on-screen detail. The display’s LED backlighting provides crisp visuals, vibrant colours and sharp contrast, while Toshiba’s Resolution+ technology delivers optimum picture quality – enhancing sharpness, colour and contrast from Blu-ray, DVD and even web content to ensure all content is displayed with brilliant definition. A speedy response time of just 5ms all but eradicates screen lag, making the screen perfect for gaming, while a 120Hz refresh rate eliminates motion blur – ideal for the faster-paced visuals found in racing games, shooters or sports titles. The Qosmio X870 enables enthusiasts to enjoy the latest HD and 3D content straight out of the box, thanks to a combination of an integrated 3D Blu-ray™ playeri and a pair of bundled NVIDIA® 3D Vision glasses. For users wanting to enjoy 3D films or play 3D games in larger groups, HDMI® connectivity outputs 3D content to any 3D TV for big-screen playback. Ordinary DVD content can also be instantly converted from 2D to 3D, breathing new life into existing DVD collections. Exceptional sound quality is provided by four advanced stereo speakers designed by sonic specialists Harman Kardon™, which combine SRS Premium Sound 3D software and Slip Stream technology to ensure the laptop’s audio performance goes hand-in-hand with the striking visuals. As a result, all audio is crisp, dynamic and bass is distortion-free, even at full volume – providing a leading audio visual experience during games, movies and music playback. The Qosmio X870 offers next-generation storage for the most demanding multimedia enthusiasts. Up to 2TB of hard disk drive (HDD) provides a vast capacity for storing movies, tracks or digital images, while an optional hybrid drive combines a HDD with an additional solid state drive (SSD), providing advanced performance for gamers who want speedy loading times and faster booting. An optional Blu-ray™ rewritable disc offers added flexibility – making it easy to back-up digital image collections, music libraries or multiple high definition video files in one place. Four USB 3.0 ports provide instant data transfer between compatible devices at speeds up to ten times faster than with USB 2.0, while the latest Wi-Fi standard support (802.11b/g/n) also ensures fast, reliable and secure wireless access – ensuring internet connections remain stable during online gaming, when streaming videos or downloading files. The Qosmio X870 features an ‘Anodized’ dark aluminium design on the lid and along the palm rest, which is complemented by a stylish red trim. Additional red accents on the speaker grille and around the large clickpad contribute to a distinctive style, and an illuminated Qosmio logo on the lid offers the reassurance of a rich gaming heritage. Red-tinted, backlit tiled keys enable users to navigate the keyboard quickly and easily in low light. The Qosmio X870 will be available from Q2 2012.